The pictures are from perhaps two weeks ago, some that I never got to post. At first I didn't think I would post them as they were so basic, but then I don't necessary think there always has to be anything crying for attention (I do like peacocking about too, sometimes, I admit). Actually now writing this text I realized it is pretty close to what I reckon as smart casual - an odd jacket, a button-down shirt, cotton chinos and brown semi-formal shoes. 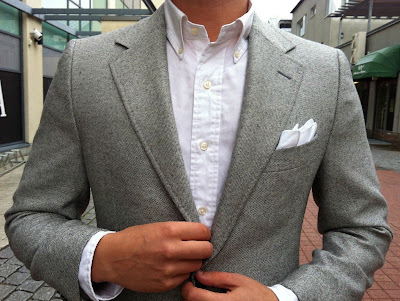 White cotton pocket square is perhaps the most neutral of pocket squares, goes well here. I hate button-down shirts that have tiny fashion collars. If you go to a department store anywhere all the racks are full of those. This one is decent, with nice collar roll and long enough collar points, but still decent at best. I wear bd shirts so rarely that so far I've put my money on other shirts, but perhaps the time has come finally to kop a few.. The chinos are navy, the color balance seems slightly off here. Shoes are my tan brogues by Cheaney, a pair that really requires a slim leg opening to look sharp. 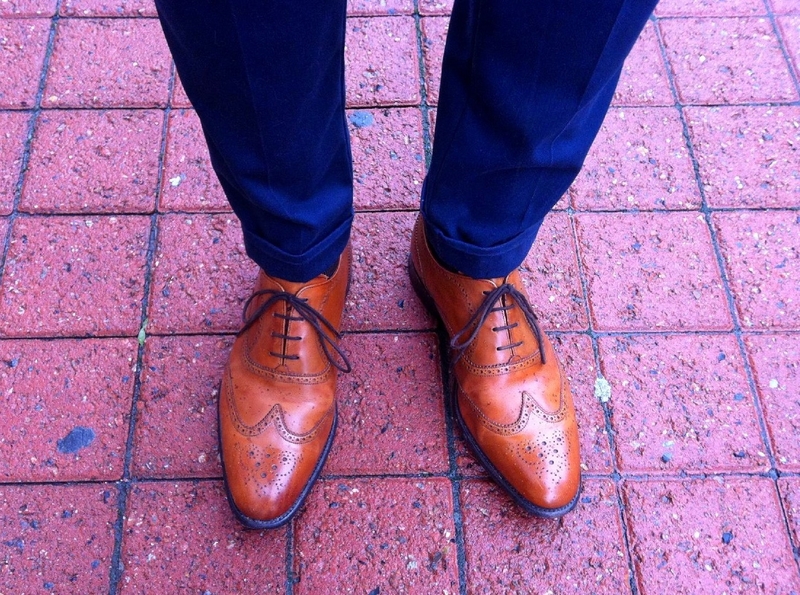 Quite beautiful shoes, but I don't really like full brogue oxfords anymore. Would prefer to wear cap toe suede oxfords or perhaps brown chukka boots here. Buut, limited budget limited style. Tomorrow I'll put up a few posts to celebrate the blog's 6 months anniversary, so check back to tune in for the weekend! Button down shirts are horrible and I don't see why anyone would really need to use them. Remind me of middle aged men working at the office, with beerguts bulging. The only time I accept them is when the button is hidden. I would say that it depends on the style of the shirt. A more Italian style bd shirt with very long collar points can be very beautiful (I actually have one coming in mail right now) if it rolls right. Anyway, I mostly agree with you. However, if you are going to go without a tie, I personally think it rarely works without a bd shirt. Also more casual and street style oriented looks usually work best with button-down shirts. Which brand and where did you buy the odd jacket? 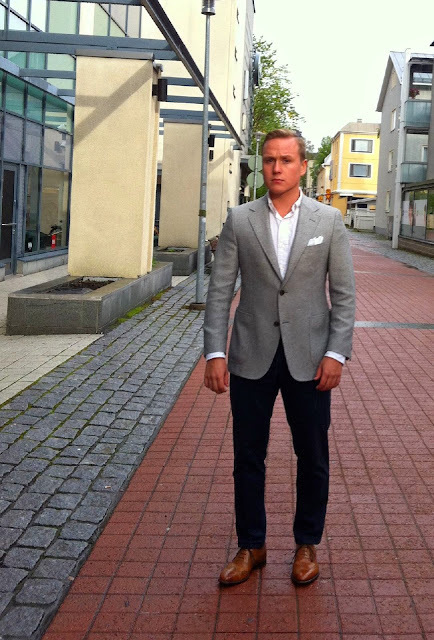 The jacket is from SuitSupply, but has had a pretty big makeover. Frankly, the original shoulders were pretty boxy and hideous. You can see them a lot in fashion at the moment, but I personally don't like full wing brogue detailing in oxfords anymore. That is, as part of my own style. Semi-brogues or U-throats can be OK, but less holes is more for me. On the other hand, long wings and country boots are still very much cool when worn with the right pieces.